As well as oxide arsenic, oxide antimony, stibium exists in two forms. First structural modification - Senarmontite - analogical on a structure an arsenolite. It is presented the beautiful enough large (to 3 sm) crystals of perfect octahedral form. Colors them greyish-white and grey. Second structural modification - valentinite -have rhombic crystals, whitish-grey and rather yellow colouring. Most often be found as dense, earthy and lamellar tabular-fibrous the masses. Senarmontite be found foremost in Algeria (mine of Khamimat, near Konstantina), where he is an oxidate antimonite and associated with other second minerals of antimony, stibium; a deposit is located among rhumss. 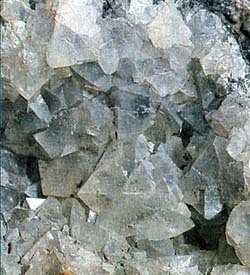 In Europe this mineral be found in many places, including such as Nedcoris in Sardinia, Pereta in Toskane and Arnsberg in Vestfalii. In Mexico in Arecibo (near Chikhua-Hua) found out the numerous copies of valentinite in an association with a native antimony and кермезитом. Senarmontite. Khammimat, Algeria. Crystals to 1,5 sm. A photo: © A.A. Evseev.